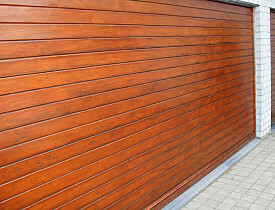 Natural wood garage doors can enhance the curb appeal of any home. The beauty of natural wood with its random patterns of grain is not an easy look to duplicate using manmade materials. If you have a wood garage door, whether it is painted or stained to show the grain, find out how routine care will keep it looking great for years to come. Unlike the siding of your home, garage doors move with every button push on your remote or lift with your arms. This movement can add stress to the door's finish and to the panels themselves. Check to see whether stress has caused cracks or gaps to form in the finish coat. Cracks are the inroads for water, which can lead to more damage. Film finishes (varnish or paint) are more susceptible to movement-induced stress and can crack and flake. Penetrating finishes (oils or stains) are more flexible and therefore hold up better. One advantage to maintaining garage doors is that they are relatively small and accessible, compared to other areas of a home. It is easy to reach the upper areas from a standard stepladder. Remove loose paint or varnish by scraping or sanding. Clean any wind-blown dust and dirt, paying special attention to the corners or gaps in the door's panels. Scrub the surface with a dedicated cleaner if mold and mildew are present. Consider power washing as an option, but use with caution; the high pressures of these machines can actually damage softer woods. Use a simple brush, along with a garden hose, to protect wood while cleaning and get the job done without the risks of power washing. After any washing, ensure that the surface has plenty of time to dry before you proceed. This time varies according climate and season and can range from hours to several days. Unlike siding, you can access the back of a garage door; to protect wood on both sides, finishing will need to done on the interior and exterior. Wood is a hydroscopic material, meaning it changes with environmental humidity levels. Wood swells in high humidity and contracts in low humidity -- a primary cause of many finish failures. If the inside of the door is not protected, it can cause finish stress to the exterior side. Because the inside of the door is sheltered from wind and rain, you will not need to maintain this surface as frequently, but it should still be checked regularly. Inside and outside finish work can safeguard wood against the effects of sun, wind and rain. Proper preparations will yield long-lasting and beautiful results. Whether you work with colorful paints or simple penetrating oils, your goal is to protect wood. The added stress of movement makes garage doors more susceptible to damage, but their accessibility can make quick work of the required tasks.